The YRG CARE Infectious Diseases Laboratory has been organizing several scientific events and workshops/training programmes. 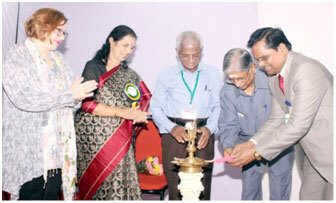 GCLP workshops are being organized since 2010 and the Science Symposium on HIV & Infectious Diseases since 2008. The Good Clinical Laboratory Practices (GCLP) was organized (12-14, March 2015) to outline the principles and procedures to be followed by medical laboratories involved in patient care and/or clinical research so as to provide consistent, reproducible, auditable, and reliable laboratory results; which contribute to good patient care and promote a positive attitude toward testing from a patient’s perspective. This workshop was designed to offer comprehensive guidance for those who are implementing GCLP in their laboratories. Prof. Thandavan, Vice-Chancellor of the University of Madras lighting the traditional Kuttuvilakku marking the inauguration of the GCLP workshop event. From the left: Ms.Estelle Piwowar-Manning (Johns Hopkins University, Baltimore, Prof. Solomon, Prof. AS. Kanagasabapathy (Principal Consultant [Hon. ], Quality Council of India, New Delhi) and Prof. SP. Thyagarajan, (Director-Research and Professor of Eminence, Sri Ramachandra University, Chennai). The International Science Symposium (30th January -1st February 2014) was focused to cover various topics encompassing HIV epidemiology, pathogenesis, host-virus interactions, immune responses to infection, disease progression, opportunistic infections, co-infections, current treatment strategy, natural history, vaccines and other infectious diseases not limited to STDs, TB and viral hepatitis. The event was inaugurated by the HIV discoverer and Nobel Laureate, Prof. Françoise Barré-Sinoussi and Dr.Jack Whitescarver, Director, Office of AIDS Research, NIH,USA. The International AIDS Society (IAS) organized an HIV Cure Satellite session in conjunction with the HIV SCIENCE 2014 on the first day evening. The satellite session was aimed at community representatives and scientists engaged and/or interested in HIV cure research, with the objective of presenting the key scientific knowledge in an accessible manner to enable participants to better understand the challenges for an HIV cure and the current research directions. The satellite also included a presentation on patient expectations from a community perspective and an outline of the IAS “Towards an HIV Cure” initiative. 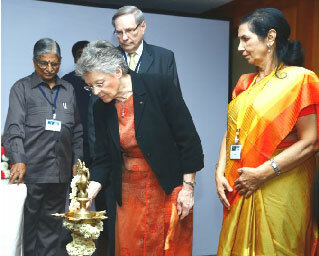 Prof. Françoise Barré-Sinoussi (Nobel Laureate for HIV co-discovery) inaugurates HIV SCIENCE 2014 while Prof. S.P. Thyagarajan, Dr. Jack Whitescarver and Dr. Suniti Solomon look on. 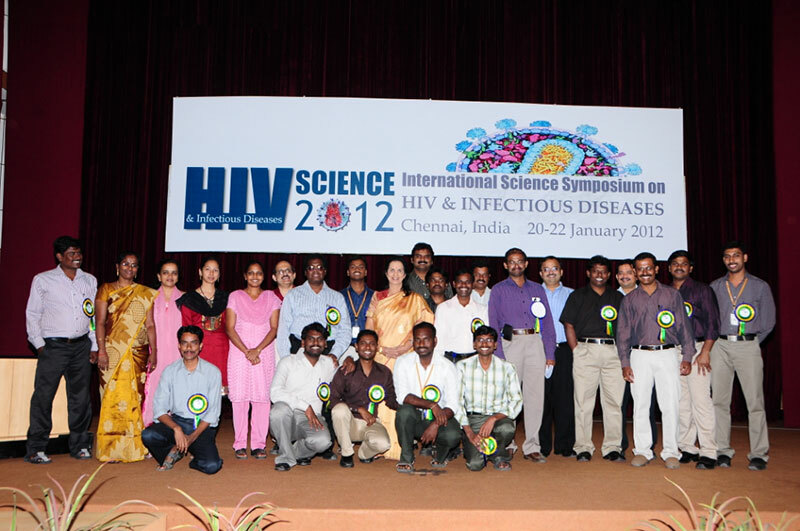 Dr. Suniti Solomon with the YRG CARE Laboratory staff at the HIV SCIENCE Symposium 2012.